With advances in appliance design and technology, washing machines and dryers are performing quieter than ever before. Once banished to the far corner of the house, the laundry is now being thoughtfully incorporated into the heart of the home with consideration to design, function – and style. Whilst we are best known for our three distinct Kitchen Systems, many Cantilever projects are part of a more substantial renovation requiring joinery design for the whole home. As one of the most utilised work spaces in the home, the laundry along with the bathroom, is typically the next focus our clients wish to invest well-made joinery. Once our clients approve the kitchen design, we then apply the same user-centered design process throughout the home. For a cohesive look, we draw from the palette and detailing of your Cantilever Kitchen System and weave this through each space. Through our design and supply service, we offer joinery solutions for bathrooms, living spaces, studies and bedrooms. Today we take a look at four favourite Cantilever laundry renovations from Whole Home Projects. Design Tip: If you’re not planning on having a dryer, a hanging rail will be your greatest ally. It’s perfect for shade drying delicate items, hosting small wash loads, or hang and steam clothing. The laundry at Beach Road was part of a sympathetic renovation for a gorgeous mid-century home overlooking Port Phillip Bay. The palette follows on from a classic white two pack and veneer K2 Kitchen featuring liberal blackbutt door fronts and open boxes. The client’s choice of luxurious Carrara marble also carries through to add a touch of luxury. With a preference for washing machine only, a custom-made hanging rail was incorporated for drying delicate items. Instead of opting for a traditional laundry trough, our clients selected our commercial grade Cantilever Sink. The drain board offers a protective work zone off the stone for more heavy-duty activities. The tall storage caters for broom and ironing board, while full drawers accommodate weekly laundry. The overheads set slightly higher for good hanging offer deep, long-term storage for seasonal use items. Design Tip: For euro laundries and compact spaces, consider a stainless steel bench top with integrated sink. Not only will it cope better with frequent exposure to laundry agents not recommended for stone but the whole surface can be utilised as a wet area. For Mills Street, the existing laundry and kitchen were merged to allow for a more extensive open plan dining and kitchen. 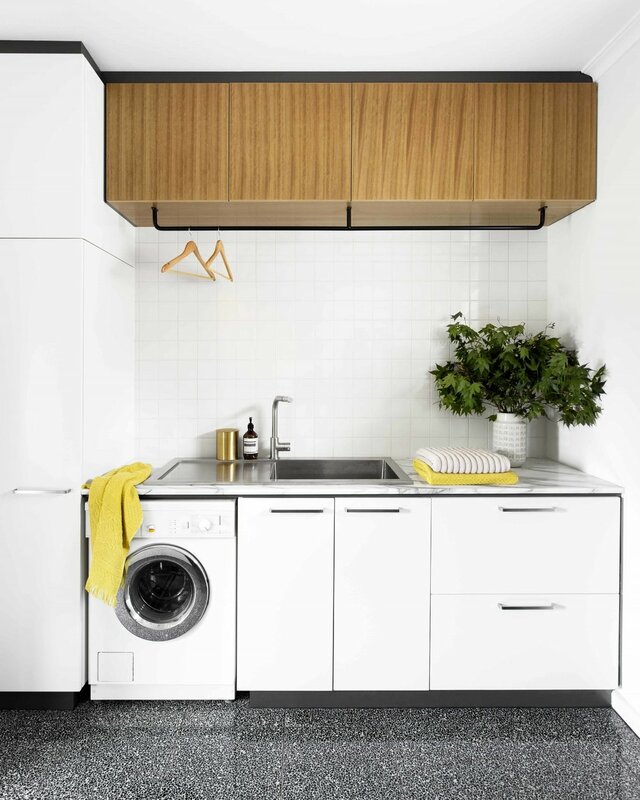 A custom compact euro laundry was designed to sit within the narrow footprint of the new kitchen layout. With similar design principals to a Cantilever Appliance Cabinet, the unit includes sensor LED lighting and adjustable shelf. Integral to the design is a custom-made stainless-steel benchtop with an integrated sink which offers maximum bench space within minimum tolerances. On a project where every inch counts, custom elements like these make all the difference to small footprint living. Design Tip: Laundry habits and requirements vary from household to household. List core items and appliances that need to be allowed for in the design process to ensure everything has a place. For Bloomfield Road, an allowance was made for a dryer they felt their growing family didn’t need just yet. For the renovation of this single fronted Edwardian ‘forever home’, it was essential to the owners that the flow between old and new build was well linked through consistent, quality joinery and detail. 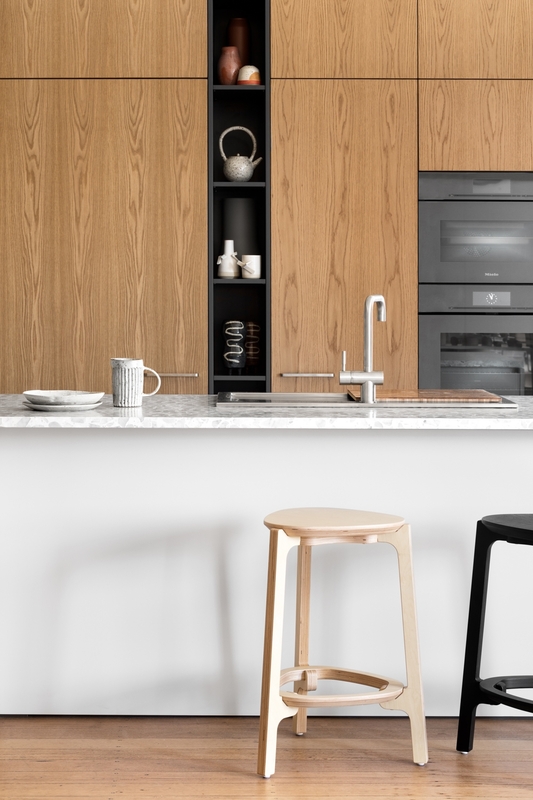 The laundry for Bloomfield borrows K1 laminate, modified with Cantilever Shadowline pulls to adopt the streamline aesthetics of the K2 Kitchen System. To maintain economy across a project, simple specification changes like this open the budget for the hero elements that ‘make’ the space – for Bloomfield, the continuation of American Oak veneer was a must. Our laundry design for Design Files Open House is the epitome of luxury. Featuring a custom palette curated with Lucy Feagins, this washroom brings together all things playful and practical. 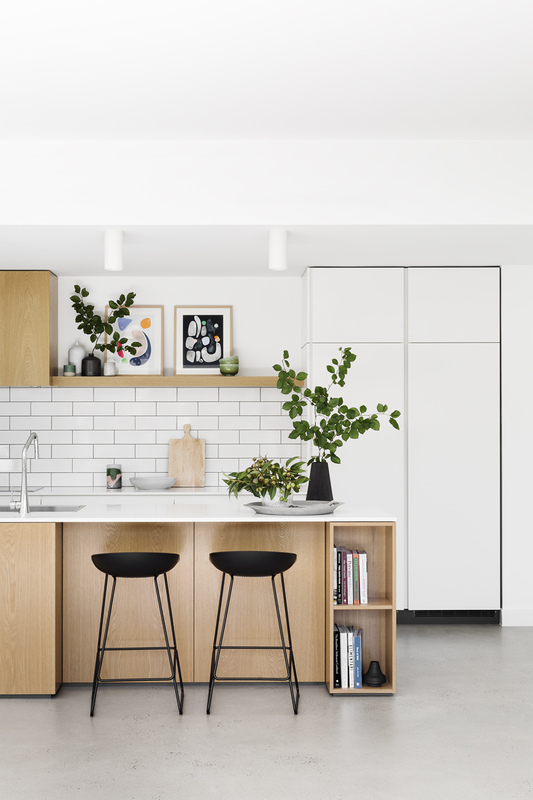 Set within a single galley footprint, this open living laundry features a Dulux palette, terrazzo benchtops from Signorino, mixer from Sussex Taps, veneer overheads with custom hanging rail, deep drawers for washing and utility cupboard for broom, vacuum and cleaning products. Featured at The Design Files Open House in November 2017, this stunning display model is looking for a forever home. Contact us for an appointment to view design, install & purchase details and to discuss how we work on your upcoming project.